American Auctioneers auctions are conducted in compliance with Section 2328 of the Commercial Code, Section 21700 of the business and Professions Code and Section 535 of the Penal Code and the provisions of the California Civil Code. Minimum Bids - $10 Increments 10% Internet Premium/Online Bidding Fee will be collected immediately upon notification that you were the winning bidder. IF YOU WIN THE AUCTION ONLINE: Payment will be processed immediately concluding the auction to your credit card you put on file (this amount charged will be for the amount you bid, the buyers premium of 10% of your final bid amount, and sales tax unless you have provided a current and valid resale number) Check out instructions will be emailed to you at the commencement of the sale with pick up info and how much time you have to remove your items. Although American Auctioneers makes every effort to carefully describe each items listed disclosing item details, known facts, and other information, occasionally new information may become available at a later time. Please make sure to carefully inspect, investigate, and ask questions prior bidding, as American Auctioneers will not be responsible for the items being sold, and assumes no liability for such items. 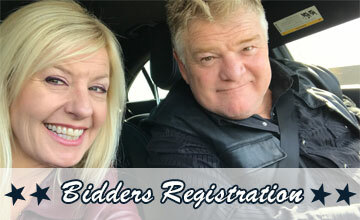 The bidder/buyer agrees to hold harmless American Auctioneers, and will assume all responsiblity for the item/lot being purchased, including but not limited to handling, transporting, licensing, taxes, fees, financial responsiblity, legal liability, working, and non-working items. American Auctioneers takes extra care to consistantly keep our online auctions running smooth without interuption or connection loss, however some things outside of our control such as data connections on location, website connections, data centers connectivity, and power failures may result in communication / data loss and American Auctioneers will assume no responsiblity for loss resulting from such occurences. Please take precautions such as attending the live sale, placing pre-bids online, and contacting American Auctioneers prior to the sale should you have any concerns. American Auctioneers appreciates your business, support, and patience. We welcome your comments, input, and suggestions. Please help us by contacting American Auctioneers Support with your input.